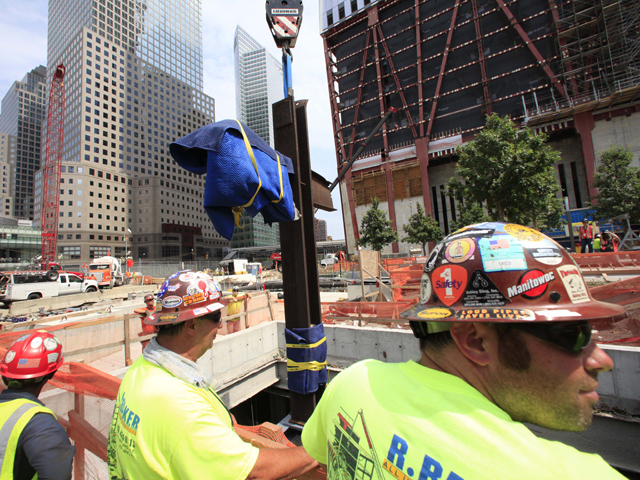 (CBS News) The National September 11 Memorial and Museum's planned presentation of the World Trade Center cross-shaped steel beam, which became a famous Ground Zero symbol right after the September 11 attacks, is being legally challenged by an atheist group. Last year, American Atheists sued the museum for the cross' removal, arguing that the steel beam promoted religion. Its legal director, Edwin Kagin, argued that the display represents "a violation of both federal and New York law in that public funds will be used to establish the Christian religion on public land." American Atheists' president, David Silverman, characterized the display as "a clear instance of a violation of the separation of church and state in its extreme." "This shrine is a cross," Silverman told CBS News on Thursday. "It was picked up, trimmed, polished, the word 'Jesus' was carved on top of it, it was prayed over in front of a church for five years, and then it was installed in the WTC memorial with no warning by a priest in a religious service where in the ground was consecrated. This is a working Christian shrine in the memorial and then they had the gall to say it's not religious in nature, that it represents everybody. That's not true. It does not represent Jews, Muslims, Mormons or atheists, and they all had deaths on 9/11." Silverman said that the museum should either remove the cross or acknowledge everybody else who died in the tragedy in a manner equal to Christians. "We're talking about public lands, we're talking about public funds, we're talking about congressionally ordered public funds. We're talking about an 18-foot memorial, this is grossly inappropriate. We feel very strongly that this is an attempt to Christianize 9/11, to make it about Christians, even though it's not about Christians at all." When contacted by CBS News, the museum said it had no comments on Silverman's claims. As reported by other media outlets, the museum in its court filing characterized itself is an "independent non-profit corporation." It called the cross an "important and essential artifact" that "belongs at the World Trade Center site as it comprises a key component of the re-telling of the story of 9/11." Michael Moreland, vice dean and professor of law at Villanova University School of Law in Pennsylvania, said there are two issues presented in this case. "If the court agrees with the Museum that it is a private non-profit organization," Moreland told CBS News, "then the museum will win because a private party can't violate the Establishment Clause - only the government can. "But, second, displays of religious symbols by the government aren't always unconstitutional. In 2010, a majority of the Supreme Court indicated that a memorial cross on government land in the Mojave Desert was constitutionally permissible because a reasonable observer wouldn't conclude that the government was 'endorsing' Christianity by displaying the cross on public land. Given the historical significance of the 9/11 cross during the Ground Zero cleanup, I think the museum has a strong argument that the cross's historical significance outweighs any perceived government endorsement of religion." According to Peter Breen, executive and legal counsel for Thomas More Society, a Chicago-based law firm involved in pro-life, traditional marriage, and religious liberty issues, said that a private entity cannot violate one's constitutional rights. "It appears based on the arguments of the lawyers of the museum," he said, "they're arguing from pretty solid ground - that a museum cannot be prohibited from displaying a historical item merely because the item has religious significance or is in viewed with religious significance by others. I think the lawyers for the museum were also right to condemn this as an attempt to revise the very history of the site by trying to keep the 9/11 cross out of the museum." The museum's recent court filing to dismiss American Atheists' lawsuit was expected, according to Silverman. "We think our lawsuit is not only valid but winnable," he said, "and it must be won in fact."